Deltabots, a ceramic 3D printing specialist, has released its latest 3D printer, and it is with the series of 3D PotterBot machines. The most recent 3D PotterBot V4.5 will cost $7, 800 and it will use the DC servo motors, and it will feature a large build envelope and the high-volume 5, 500 ml extruder. 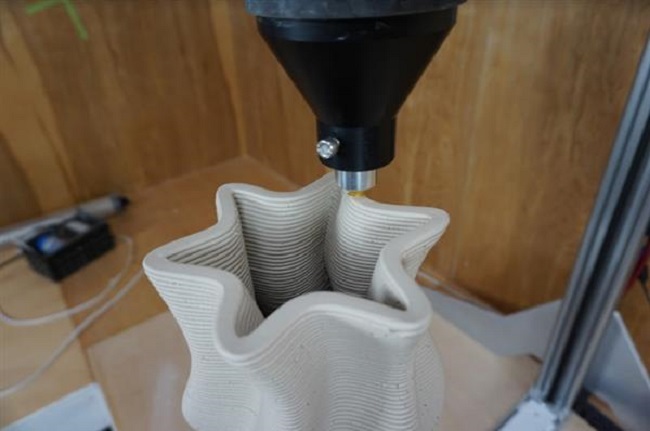 This type of 3D printer might look nothing like its original potter’s wheel, but it is becoming more and more efficient as a manufacturing tool. The ceramic 3D printers are used by designers to create highly complicated digital designs and innovate it to build pottery with ease. These 3D ceramic printers can even blend with the traditional and modern techniques in molding by manually shaping and deforming the ceramic material as it 3D prints. Deltabots is one of the best manufacturers in producing ceramic 3D printers is. It is the company that created the PotterBot series of ceramic 3D printers. This Florida-based firm has recently released its latest printer, the PotterBot V4.5. It is a quiet and powerful machine that print vessels up to 36″ or 914mm tall, and it can extrude 22 pounds of clay in one print. The ceramic 3D printer uses about 5, 500 ml extruder and it is controlled by the DC servo motors. These servo motors can operate on a closed-loop system, and the massive extruder uses a direct nozzle extrusion which means that users do not need to clean the hoses and even deal with complex delivery systems and air compressors. 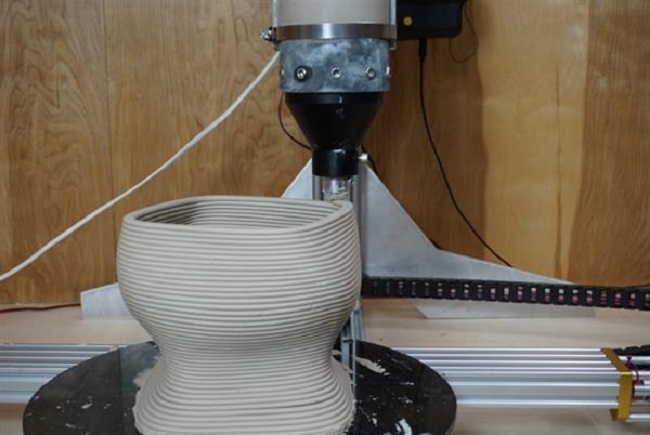 PotterBot V4.5 is a new ceramic 3D printer that can extrude actual clay easily from its container. It uses a U.S-made Acme lead screw and other components from the IGUS, a German company who specializes in bearings, cable carriers, and nozzle guides. The design offers the users an option of choosing from a number nozzle diameters which can lead all the way up to 16mm. This width can give users an almost unlimited design potential regarding its detail and size. 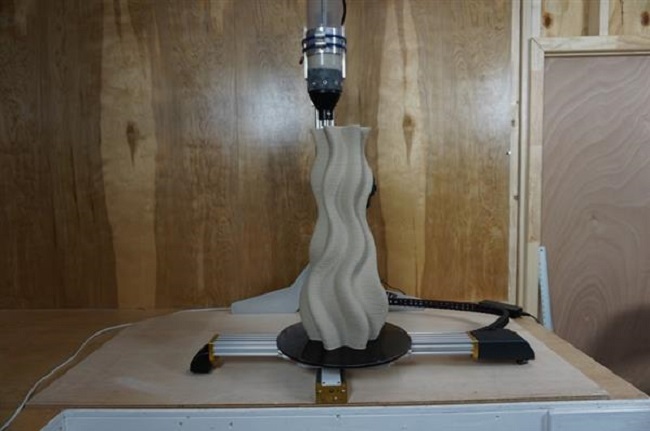 The ceramic 3D printer uses a exceptional system with the extruder traveling X & Y and the stationary Z-axis. The X axis is supported by a mechanism at the end of each rail. This can allow the device to travel easily on top of any flat surface. The new 3D printer is similar to the CNC mill in some ways. It also uses a quiet DC servo motors which can provide accurate and stable motion during printing. DeltaBots also stated that these engines should provide “extreme longevity” in both academic and professional use. 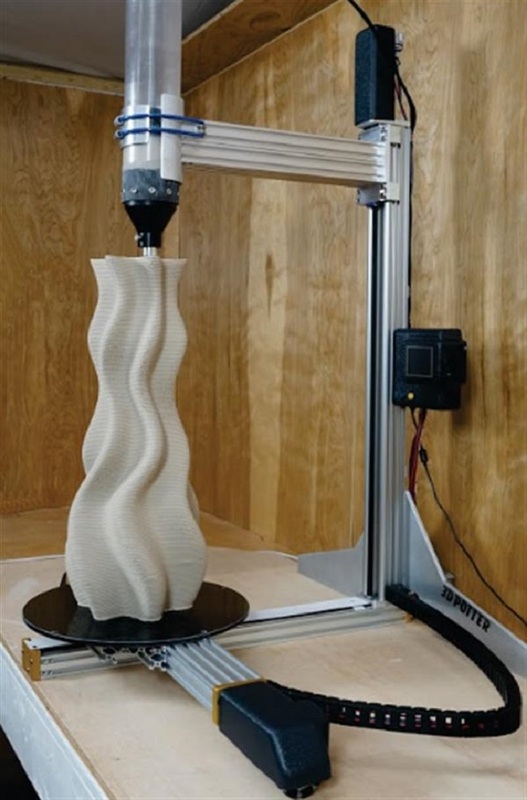 The new ceramic 3D printer also uses the same Cartesian system that implements a bigger volume without needing a large sliding bed or box structure. The PotterBot V4.5 runs on an ARM Cortex-M3 processor which boosts its performance and its speed. The compact and portable design can provide overseas shipping with ease. The large-capacity extruder can hold around 24 lbs of clay, and it is also designed to cater large-scale vessels or projects that will require continuous extrusion without causing any trouble for the material and design. DeltaBots recommend using the machine for production environments. The power and speed it provides the users be thanks to the CNC components and Acme screws. Also, the device also offers features such as touch-screen Control Center and a direct USB servo connection.